After choosing the polymer and bitumen, the two components are mixed to ensure the polymer has homogeneous distribution and complete dissolution. Generally high shear mixers are applied to ensure particle size reduction of the polymer and to obtain a close contact between bitumen and polymer. The system’s setup and the sequential process steps need to be chosen and controlled to ensure the best resulting product. Kraton D polymers are supplied as porous pellets, which have excellent solids flow characteristics for handling and high bulk density for storage. This is a good combination for systems equipped with high shear mixers. Alternatively, milled versions are available, which can be applied when low shear mixing equipment is used. High shear mixers grind the polymer while immersed in the bitumen. The polymer is mixed into the bitumen and passed through the high shear mixer, to cut the particles into small pieces. The size of the pieces is influenced by the gap width between the stator and the rotor. 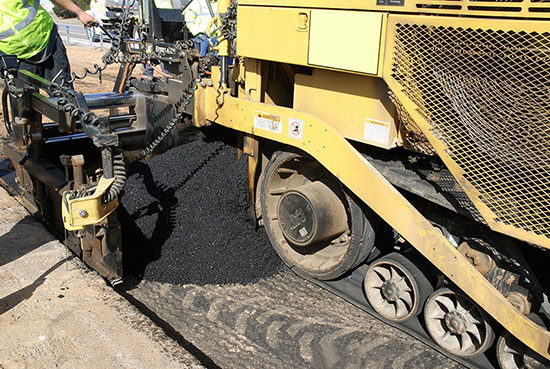 Decreasing size increases the specific surface area, speeding up the bitumen’s absorption of the oily components. The absorption of oily components softens the polymer particles and allows shear forces in the high shear mixer to tear and stretch these particles, further increasing the specific surface area. Eventually this results in a homogeneous dispersion of the polymer throughout the bitumen. The high shear mixing process is typically carried out at 180°C. A 10-ton batch of 12 percent polymer in 150 PEN bitumen has a batch cycle time of 1-2 hours. The energy input from the high shear mixer increases the temperature during the process. Further dilution then occurs to achieve the final desired bitumen binder. Contact your Kraton sales manager to discuss optimal processing conditions.